Brother Jesse Blog: S.H.A.P.E. 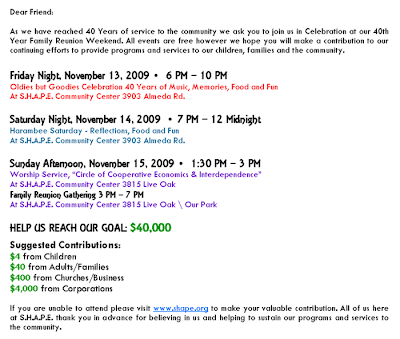 Community Center celebrates 40 years of service in the community! Reunion weekend Nov. 13-15. 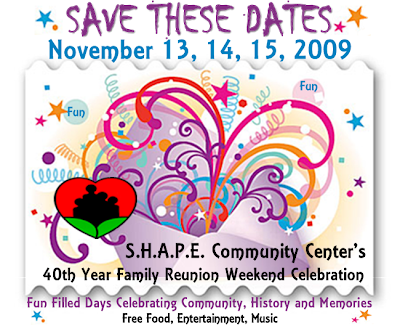 The S.H.A.P.E. Community Center is a landmark not only in Houston but the country. We call it the "United Nations of the 'Hood" because it has hosted every type of leader and organization you can think of. Everyone is welcomed by its founder Deloyd Parker, who has been an example of true leadership, which is service to the people.